In the wake of unconstitutional policies effecting people across the globe, there’s no better time than the present to talk about how much we friggin’ love diversity. It’s what makes countries, companies, and hell, it makes breakfast thrive. It keeps things interesting, fresh and exciting every single day. We don’t have to tell you how bloody brilliant mornings are because of it, but we want to show it off anyway. Here is just a handful in a sea of breakfasts in London that are inspired by, sourced from and/or run by our friends from around the world. #NoBan. Power-couple Sarit and Itamar, both who have been cooking since the age of five, set up shop in London to make delicious, authentic Middle Eastern food. You probably have their cookbook on your shelf. Expect Shakshuka, Boureka and Phylas. Find them here. Our favourite Persian bistro in London, husband and wife duo Bahman & Negar create new menus weekly. Although most of their ingredients are sourced from right here in London, many of their dishes feature ingredients sourced from their home country of Iran. Find them here. With vintage hanging lamps and fans, as well as old Indian newspaper, photographs and magazine clippings decorating the walls, you’ll feel like you’ve just stepped into one of Bombay’s post-colonial Irani Cafes. Did someone say “Bacon and Egg Naan Roll”? Find them here. As an Ottolenghi restaurant, NOPI pretty much promises you delicious food. Their seasonal menu is full of Middle Eastern and Asian-inspired dishes, and breakfast is definitely not a meal to miss here. Think Black Rice Porridge and Shakshuka. Find them here. Inspired by Greece and made in London, OPSO brings flavours of the Mediterranean all-year round. 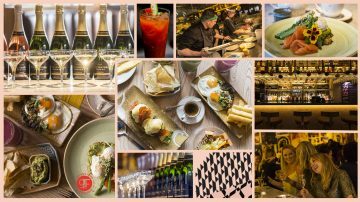 A popular brunch spot, you can pair your breakfast with cocktails based on Greek liqueurs and spirits to kick start your weekend. Find them here. 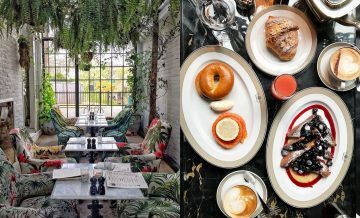 A breakfast hotspot in Stoke Newington, The Good Egg’s ever-changing menu harmonises influences from the Middle East and New York City. With options like Cardamom Coffee, Iraqi Aubergine Pita and Manoushi, you can’t go wrong. Find them here. One for a sunny day, the Venezuelan canalside café in Haggerston is known for their incredible Venezuelan cheese. If you’ve never had a Venezuelan breakfast, sitting on swinging chairs is a good place to start. Find them here. 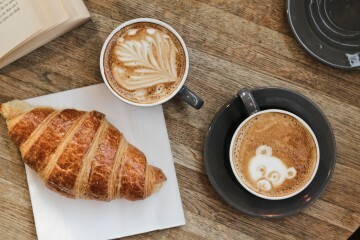 If anywhere knows the beauty of diversity, it’s The Monocle Café. Whether you’re after a classic Scandinavian breakfast, Japanese breakfast or a good ol’ Bircher Muesli, they’ve got you covered. 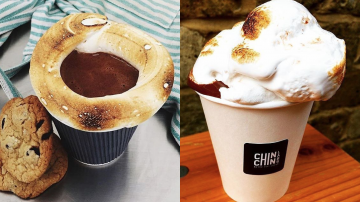 Be sure to pair it with a drool-worthy Matcha Hot Chocolate. Find them here. Tucked away in Borough Market under a Victorian railway arch, Arabica Bar & Kitchen brings you “an epicurean exploration of the beguiling flavours and worldly hospitality of the sun drenched lands of the levant”. Wave hello to Turkish Eggs, ABK Porridge and Ful Medames alongside Turkish coffee. Find them here. In a South-American inspired setting, Andina is bursting with colourful food made from superfood ingredients native to the Peruvian Andes. Even better, they’ve got options for basically every dietary requirement out there. We’re all for the Huevos Q’apachana and Camote Pancakes. Find them here. Brainchild of the oh-so-talented Thomasina Miers, Wahaca brings a taste of Mexican Street Food to the UK. With breakfast only currently available at their Oxford Circus branch, get your Mexican fix in the morning with Mexican Scrambled Eggs, Sweet Potato Rostis and a Breakfast Burrito. Find them here. Cafe Loren brings our Shakshuka obsession to another level. 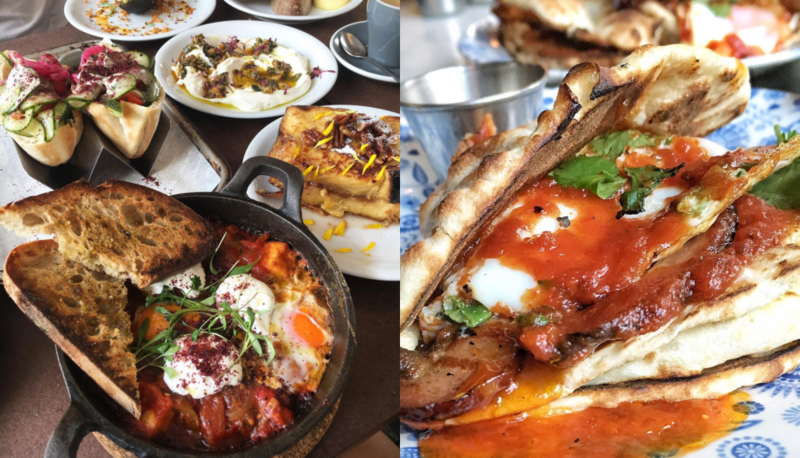 A not-so-secret hidden gem in Camden, their Shakshuka-dedicated menu has everything from Red and Green Shakshuka to Vegan Shakshuka. This Israeli coffee shop, along with their coffees and teas, is not one to miss. Find them here. Despite their name, this surprisingly isn’t a dry-cleaning service. Chinese Laundry in Islington has been blowing up on our Instagram accounts, bringing lesser-known dishes from Mainland China to London, served in a space inspired by 1980s Chinese home life. Find them here. If you’ve ever had the dilemma of deciding between an English Breakfast and Udon Noodles (hey, you never know), Koya Bar has your answer: English Breakfast Udon Noodles. For a bit more of a culinary adventure, their breakfast menu also serves up traditional Japanese Breakfast and Kedgeree Rice Porridge. Find them here. In the heart of Golders Green, SoYo serves up Kosher, Israeli breakfast. 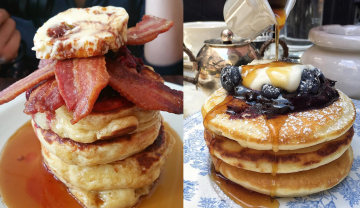 Their menu is an absolute dream – from Organic Acai and Vegan Breakfasts to Eggs Benedict and Oreo Pancakes, this family-friendly joint won’t struggle to put a smile on your face. Find them here.